The first thing you’ll notice about this pack is the organization and the amount of pockets it has. There’s a spot for everything here. I like knowing where my gear is, and not fumbling around through a lot of stuff to find what I’m looking for. The pockets let me organize all my items and do a quick pre-ride inventory making sure I have everything I need for a day in the mountains. To get to all those pockets, the compartment zippers go clear down to the bottom of the bag allowing you to flip the pack open like a book. The items in the bottom of the pack aren’t any more difficult to get to than the items in the top pocket. 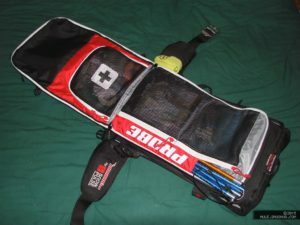 There’s a dedicated pocket for first aid equipment which makes identifying where those items are easier for someone who may not be familiar with the pack. The zipper for that section of the pack is also a different color than the rest of the zippers. In an emergency, communication is critical; and being able to explain easily where a tool or item is makes the response to that situation that much quicker. Flipping open the main compartment of the pack, you’ll see the airbag, cylinder, and more space for equipment. Since there’s no pockets in this compartment, it’s best for the larger items. I kept my camera gear, windbreaker, extra gatorade/water, and radio in this compartment. 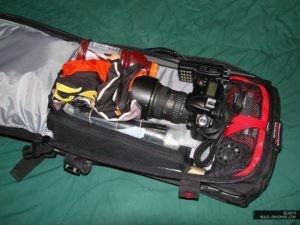 There’s enough room for everything I carried including additional lenses and a strobe or two with me. 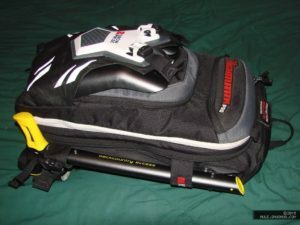 I generally opt for the larger packs since I like having the ability to carry more equipment when I need to, but I don’t need to fill the pack full all the time. The airbag is contained inside a mesh pocket that’s only accessible from the airbag zipper. The cylinder and trigger assembly is protected in a zippered sleeve allowing you to remove it if necessary, but also keeping it secure when you’re wearing the pack. 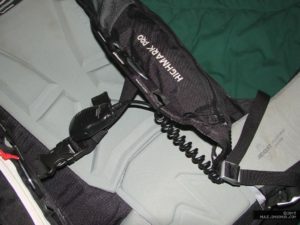 The Highmark Pro, like most avalanche airbag packs on the market, has space dedicated for a shovel and probe. 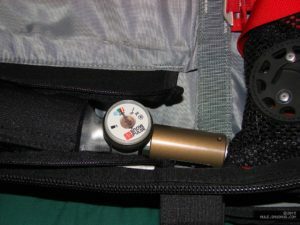 The probe stores in a sleeve on the inside of the pocket compartment, again, easily identified by the unique zipper color and silkscreening on the sleeve. Even the larger/longer probes such as my 300cm BCA SR3 probe fit easily in the sleeve. The shovel blade has a pocket on the outside of the pack. That pocket fits most shovels comfortably snug and secures it in place with two buckles at the top. A larger shovel such as the BCA B52 won’t fit in here, but the BCA Dozer I carried last year fits nicely. The shovel handle slides into two loops on the right side of the pack and secures at the bottom around the D- or T-handle with a plastic buckle. On the Dozer shovel, I had to remove the secondary plastic handle that you’d use on the free end with the shovel in “hoe-mode” to fit the handle inside the pack. I never really used the shovel in that configuration, most often it was in the traditional shovel mode, so not having that part wasn’t a big issue for me. Since this is a larger pack, it does fit taller/bigger riders better than smaller/shorter riders. There’s plenty of adjustability in the pack, either with the straps on the shoulders and waist belt or by moving certain components like the chest strap or waist belt up and down. The waist belt can be adjusted up or down a little bit, offering a better fit around a belt or protective vest. The chest strap has metal cleats that can be moved between a few slots in the shoulder straps to position the chest strap/buckle where it’s comfortable. Generally keeping it higher on your chest is a better position – keeps the shoulders on your shoulders should you need to deploy the airbag. If you use an external speaker-mic with your radio, that puts it closer to your mouth and makes it a little easier to hear when someone’s calling. The main reason I like this pack is the head and neck protection it offers. Unlike the ABS bags that blow off the sides like butterfly wings, this inflates behind your neck and down the shoulders offering you far better head/neck protection. The other reason I like it is that it’s easy to refill the gas cylinder. The Snowpulse packs use compressed air rather than a nitrogen cylinder, so many scuba and paintball shops can refill it as long as you have a replacement burst disc. The trigger stows in a zippered pocket on the right shoulder, should you need to deploy the airbag in an avalanche your right hand can remain on the throttle. While the handle is easy to grab, I didn’t feel it was too easy to accidentally deploy in the trees. I’ve been wearing an avalanche pack for many seasons now, and this is the most well-thought-out pack I’ve tried.